First, we got to say Shawn, you aren't fooling anyone with that beard. We're not claiming that he's looks like Saddam Hussein. 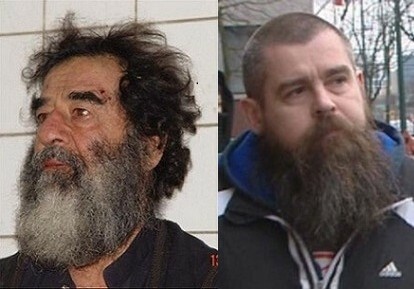 We're just noting that in this picture, Shawn bares a striking similarity to the late Iraqi dictator. Oh, we guess we are saying that he looks like Hussein. Just a little. Right? Second, you're starting to show your age. 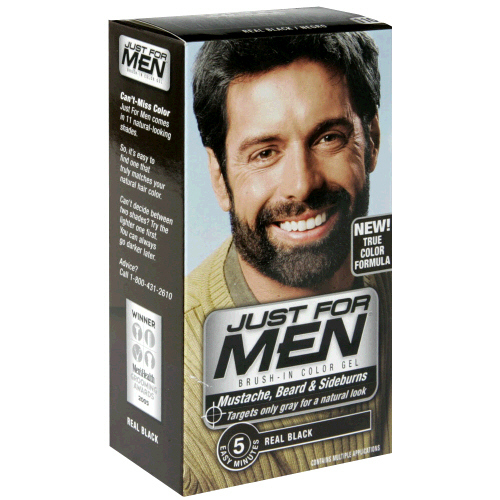 Ever consider Just For Men? Our friends in Vancouver published an article today and posted a video to YouTube. You tell us. Does the guy being interviewed (not Christie, of course) look like an either D.A. or E.A.? 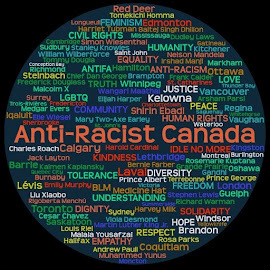 Approximately 25 anti-racists attended the Friday, January 27, court appearance of Shawn MacDonald (39), a member of the neo-Nazi group Blood and Honour charged with three assaults against people of colour in the Vancouver area. Shawn MacDonald's court appearance delayed till 1:30 pm today (same courtroom 307 at 222 Main). He has plead not guilty to the hate crimes and they are setting trial dates (he elected for a judge and jury). His lawyer is infamous/notorious far-right libertarian Doug Christie who has a history of defending white supremacists and neo-Nazis (Keegstra, Zundel, Collins, Fromm etc). In addition to this, the individual who originally posted this message also stated she received an email from someone trying to intimidate her into being silent. From what we know about this woman, that ain't happening. For the benefit of our bonehead readers, does the term, "chew you up and spit youu out" mean anything to you? We were asked if we would be interested in posting the article below by No One Is Illegal. 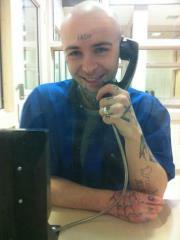 This Friday January 27th Shawn MacDonald appears in Court at 222 Main Street (at Cordova) at 9am. NOII members are planning to attend court, but since it is a work-day we would like to ensure there are enough numbers. Please RSVP to noii-van@resist.ca if you can join us, we encourage white allies to be present and people of colour to break the fear, silence, and invisibility with us. Oh, How We've Missed You Tom! A relatively new poster on Stormfront going by the handle, "National Socialist Skin" caught our attention a while back. Oh, not because he seemed significant in and of himself, but he just reminded us of someone. He lives in Lethbridge. Has a tendency to name drop and brag about his status in, "the movement." Made fun of John Marleau. Talks about what he would do if he were in the same room with [fill in the blank] individual and it would not be pretty, he could sure tell you that. We thought.... and then decided no. Couldn't be him. There was no evidence that "National Socialist Skin" has flown into a rage over some perceived slight and wasn't threatening people on Stormfront itself. Over the past few years, we've taken a look at the claims made by Marc Lemire and his supporters regarding his ties to the Heritage Front. In the process we have done a pretty good job of proving that he was a member (and based on the evidence likely the leader for a time), worked closely with Ernst Zundel and held views that most of society would view as objectionable (though not necessarily illegal). These articles can be used as a resource to truly examine Lemire's claims, though we would urge our readers not just to take our word for it and to do their own research. But the resource isn't useful if it isn't readily available and as it is one would have to actively search for these documents. 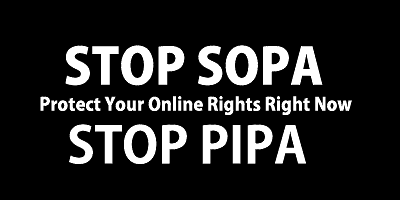 So, as we have done with our timelines, we are going to compile the list of articles we have written here and then add the link to our permanent links below the blog header. We hope that this will be more useful to our readers and other researchers who wish to test the veracity of both Lemire's and our claims. De Chazal and Miller will next appear in court on February 13, but in the meantime a little more information about the attack on the Filipino man has been released. It's alleged that De Chazal and Miller were having a party on a rooftop terrace overlooking the street where the incident took place. When the Filipino man lay down on the discarded sofa, De Chazal and Miller are believed to have gone outside and set the man on fire. When a good Samaritan (who was black) tried to help, he was assaulted and called at least one racial epithet. This is what we've been told, however we will know more when the details are covered in the media. UPDATE: Story carried covered on the CBC. Witnesses claim two alleged members of a white supremacist group charged with a racially motivated assault spontaneously targeted a Filipino man they saw sleeping on a discarded couch, CBC News has learned. Our previous articles (here, here, here, here, here, here, here, here, here, here, here, here, here, here, and here... phew!) on the subject have all called into question Lemire's claim that he was only, "peripherally" involved with the Heritage Front in his teen years but instead support the conclusion that he was in a leadership position as early as the late 1990s and was the functional head of the the group by 2001. In a sense then this article is overkill, but there is one issue left that we do want to address, that being the belief by our detractors that there was nothing written by Lemire himself that links him to the Heritage Front. 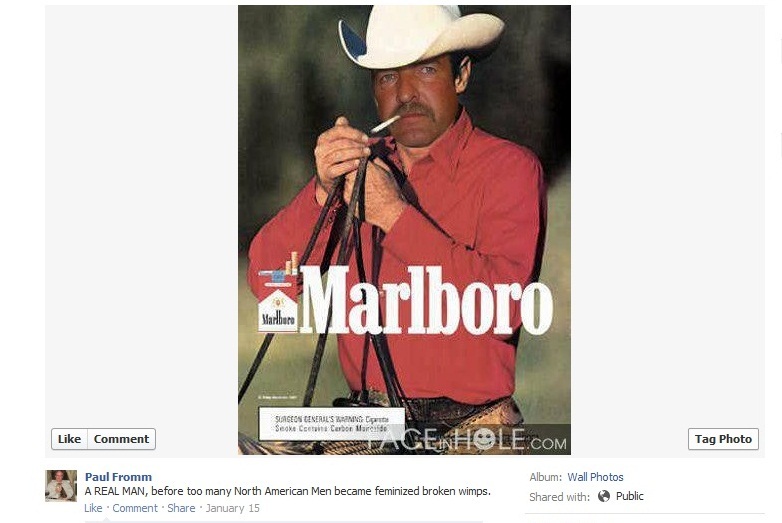 Aside from the fact that the face here has been photoshopped very poorly (though Paulie doesn't seem to realize this), it's clear that Paulie has a thing for the Marlboro Man. 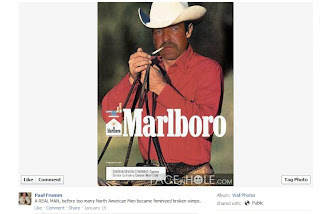 Or, rather, the myth of the Marlboro man. Hey, that's a good look for you Robert! It's been about 10 months or so since we last wrote about Michelle Erstikaitis, the troubled young woman who Paulie inexplicably went to bat for by claiming she was in trouble because of her, "White Nationalist" views. And we certainly were not the only one's scratching our collective heads on this one, as his fellow travellers also frequently asked, "wtf?!?" Ugh. So Here We Go Again. on giving them any help to do so. 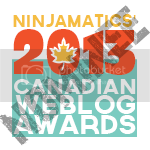 So, they plan on making this thing happen in several places across Canada, do they? Seems last year they claimed that the Calgary event would draw boneheads from across Canada and the United States and, well, we all remember how that went, right? First, some kudos are due. Our friend Dr. Dawg managed to scoop up on our own turf. That would be this event. Move along. Nothing to see here. Good on ya Dawg! Of course now we're going to have to do something to reclaim our preeminence (tongue firmly planted in cheek) in the field of covering street-level boneheads. We had posted this story earlier. Here is some documentation for today's historic event. A special thank you to Rabbi Harry Brechner and everyone involved including the nice people who restored the vandalized grave stones to a pristine condition. The event began at 1 pm, lasted perhaps an hour or so. Was attended by a crowd estimated at being at least 1000 people, which is an unprecedented number to have ever had in our cemetery within living memory. I have posted the videos and photos from the event here, and you can download them for viewing and consideration. Please send them around to others who might be concerned or interested in this matter. NOTE: First, because of its relevance, we would suggest our readers take a look at the latest post on BCL's blog. 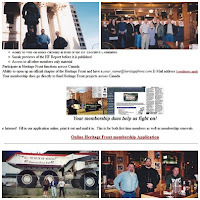 BCLSB author Michael J. Murphy's online repition [sic] (likely repeated to MP Chisu) of a 'Wikipedia' comment that "Lemire was the last president of the often violent Heritage Front organization", is calumny. 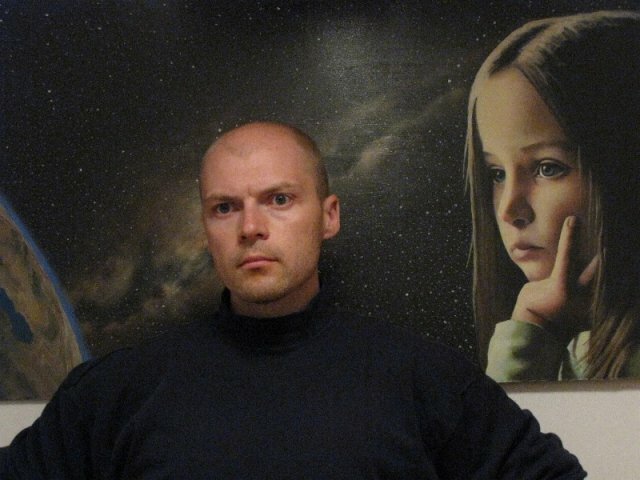 Under-handed methods to diminish Mr. Lemire's public reputation include a concerted effort to paint him as 'Heritage Front Fuhrer', as illustrated by the 'BigCityLib Strikes Back' posting referenced above, and a series of ongoing articles mounted on 'Anti-Racist Canada', and disseminated to associated online websites, entitled 'Examinations of Marc Lemire'. The effectiveness of the methods employed to blackball Mr. Lemire are amply illustrated in the immediate reply from MP Corneliu Chisu on the same day Michael J. Murphy contacted his office to share, presumably, similar tainted information to that which he earlier posted online. Now, for someone who claims to have only been peripherally involved with the Heritage Front in his teenage years, it is interesting that he has surrounded himself with people who were members of the Heritage Front. 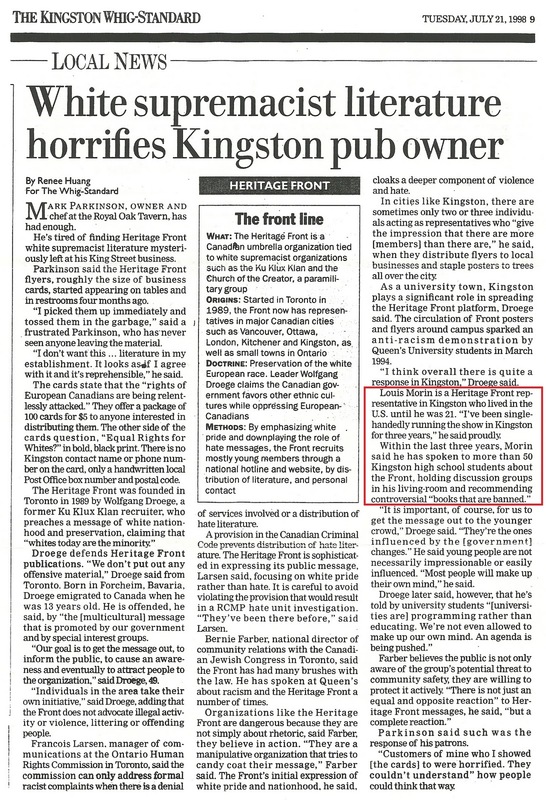 In the last post on the subject, we included a newpaper article from July 21, 1998 which provides information concerning Heritage Front activities in Kingston, ON. 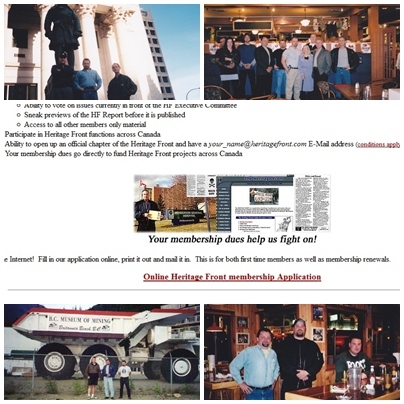 At this point the Heritage Front was still active, but it is pretty clear that the Bristow affair had resulted in a precipitous decline in the fortunes of hate group (there would be a brief resurgence in 2001, though this too would be short lived), but it is clear that Droege and the remaining chapters across Canada were still trying to make conversions. MacDonald has not been convicted of any of the charges. 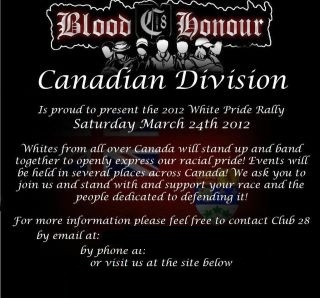 He also has no proven association with the Blood and Honour organization. But we think that we all need to consider that any allegation needs to be proven when the case goes to trial, even something as seemingly self-evident as Macdonald's group affiliation. So we're going to cut the CBC some slack here. CBC News has released a video showing a black Vancouver man being beaten by an alleged white supremacist who has since been charged in connection with a string of apparently racially motivated attacks. A CBC News videographer happened upon an apparent road-rage incident while on duty on Vancouver’s West Side in December 2008. Again, we would ask our readers to help us out on this one. A mosque in Gatineau, Que., that has been a target of vandalism was spray-painted with graffiti overnight. Workers at the Outaouais Islamic Centre awoke Thursday to discover swear words and derogatory references to Arabs and Allah spray-painted in white. The vandals painted messages on the front doors, across the building's side and on two other entrances to the building. The mosque had earlier been vandalized Monday morning when windows were damaged and someone attempted to set fire to two cars in the parking lot. 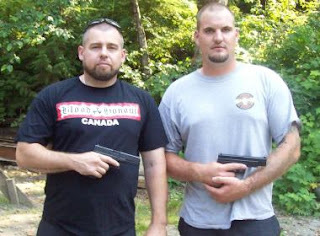 We're just going to cut to the chase on the extension of this series examining Marc Lemire's connection to extremism and specifically to the Heritage Front. He repeated this claim when he appeared on Levant's program again in December. 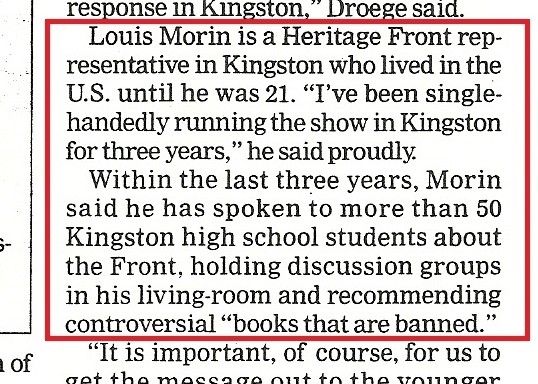 We are going to prove, yet again, that Lemire is being less than forthcoming and that he was actively involved with the Heritage Front until it finally went defunct sometime in 2005. We've been given a lot of good tips regarding old and recent examples of vandalism and harassment. 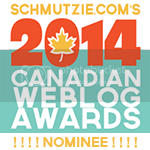 We're hoping our readers can step up and help us with this one as well. Those feelings channeled through Rabbi Harry Brechner after learning that five historic gravestones in Emanu-El Jewish Cemetery in Victoria – all belonging to Holocaust survivors – had been desecrated. Victoria police say the large stones were spray-painted with black swastikas and other images sometime between 8 p.m. on Dec. 30 and the early morning hours of Dec. 31. An unsolved attack on a Gatineau, Que., mosque is being called a hate crime by a national Muslim organization, after cars were smashed earlier this week. When Montreal Massacre memorials were about to take place in early December, Big City Lib had reported on plans by the Jewish Defense League and Canadian Hindu Advocacy to demonstrate at a vigil at the University of Toronto. Despite a request by the University to not attend, they did anyway. At the time, we didn’t want to help JDL and CHA in their efforts to co-opt the day of remembrance, so we kept the focus on the victims. But we feel this deserves commentary, and more than enough time has passed to respectfully do so. It began with a photograph of the murder victim on the detective’s desk. As the days and weeks went by without an arrest, the investigator transformed an empty office into a situation room to try to find whoever killed Mark Mariani in October 2010.